Firstly I would like to congratulate you on your engagement and thank you for taking the time to read and consider what Digital Sound Services has to offer. I have been specializing in wedding reception entertainment for nearly 14 years and I am qualified to make your event a success. Every couple is different, with unique needs, so I will take a personal approach to your wedding. I want to get to know your tastes and preferences as I will tailor your reception to your dreams and desires to help make your day stress free, elegant and most of all fun. From the cocktail hour, to your entrance music and first dance, through dinner to cake cutting and the dance sequences of the reception, all the way to the last song, I will be there every step of the way to build a customized smooth running event based on your tastes and ideas. I will transition seamlessly from being a well spoken emcee, when events dictate, to being a knowledgeable DJ who can read a crowd and play great music that every body will enjoy, whilst smoothly coordinating events. Nothing is more pleasing to a bride and groom than to hear their family and friends comment about how much they enjoyed attending your wedding and how much fun they had. A great wedding DJ with years of experience, such as myself, can create that lasting memory. 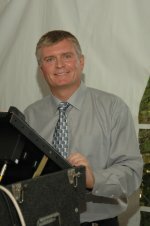 I would be delighted to discuss your vision for your wedding day and your musical entertainment requirements, so I would invite you to call or email me.